"Just wanted to keep you warm." Here are some sites that have been kind enough to link to us. A site with an episode guide, cast info, theme song download and lyrics, along with links to many other sci-fi show pages. A Roswell site with news, features, merchandise reviews and an episode guide. A Liz and Max site where the love shown in season 1, still lives strong. Fanfic author RosDeidre's site has closed but you can find some of her stories available elsewhere by searching her name. You can also find her published fiction in bookstores! A bilingual site for Roswell fans, with pics, walls, episode guides, cards, music guide, covers, information, bios and poll. 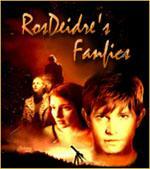 This site is dedicated to Roswell Fan Fiction with a few added bonuses such as music videos and episode downloads. If you would like to advertise our project on your site, please click here to select a banner.